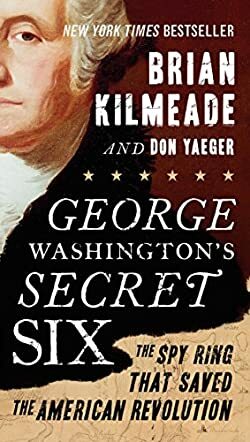 George Washington’s Secret Six by Brian Kilmeade and Don Yaeger is the single most illuminating piece of non-fiction it has ever been my pleasure and honor to read. History of the daring Revolution against King George of England and his much superior fighting force comes alive within the covers of this remarkable text. The subject of this book concerns the pivotal involvement of a surreptitious ring of six spies who maintained a steady, if circuitous, flow of critical information from New York, where British military was firmly entrenched, to Washington’s headquarters in New Jersey. It may rightly be said the United States of America might never have existed, were it not for the courageous efforts of these six ordinary people. So secretive was their existence that to this day the identity and ultimate fate of one of them is still not known. General George Washington, Commander-in-Chief of the Continental Army, by design, did not even know the names of his crucial links in the fight for independence. George Washington’s Secret Six is not a fictional story; it really happened the way the authors have presented it. Nearly one quarter of this volume is given over to documentation of every assertion made by the authors. However, being true does not mean it is boring. It is as captivating and filled with intrigue as any best-selling fictional espionage thriller. This book goes way beyond your High School History class, expounding upon events so clandestine their existence was known to only a very few of the participants’ descendants long after the fact. Yet, the methods devised by Washington and his confidants were so advanced for their time that they are still taught today to CIA intelligence agents. Brian Kilmeade and Don Yaeger researched this critical bit of history for over 25 years before they were sufficiently confident of the integrity of what they wanted to publish. If the spies had failed, the entire planet would have proceeded down a different path. It has oft been said George Washington is the father of our country. George Washington’s Secret Six proclaims the truth of that statement like never before.